Liverpool based Adlib’s specialist sales and installations division has designed, specified and supplied an L-Aacoustics Kiva system complete with Soundcraft console and line system to Newcastle based live event technical provider, R&B Group. R&B Group, established 22 years ago, specialises in high end corporate and live events. Adlib has worked with the company for around five years, supplying sound equipment for some of their larger events. R&B Group development director Antony Crerar explained that when the time came to undertake an extensive audio upgrade, having already collaborated on several occasions, they asked Adlib to assist in providing a turnkey audio solution to fit their range of work and budget. The interest in L-Aacoustics was initially sparked by another Newcastle based company Nitelites who purchased an L-Aacoustics system from Adlib two years ago. R&B had hired the system several times in the meantime, and really appreciated the sound quality. They wanted a system that would produce crystal clear voice and spoken word reproduction as well as something with the power and punch to deliver great sounding live music. Like Nitelites, R&B decided to consult Adlib and together they fine-tuned a system to meet their exact requirements. A total of 18 L-Aacoustics Kiva two-way passive ultra compact WST enclosures were supplied together with six L-Aacoustics 8XT speakers, plus four L-Aacoustics SB15m subs and eight SB18 subs, flying frames and a stacking system, along with six L-Aacoustics LA8 amplifiers. Crerar is very happy with the crisp, clean sound of the Kiva and its uniform distribution. “It’s awesome,” he states. 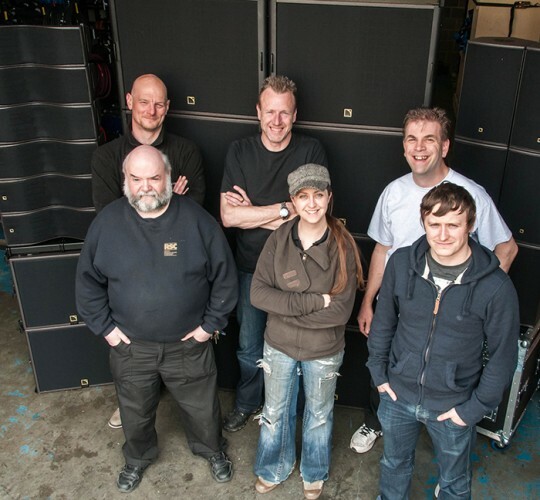 The other advantage of Kiva speakers is their light weight of 13kg, which means a decent sized array can be flown at under 100kg which suits many of the venues in which R&B regularly work. It also looks neat, elegant and unobtrusive, which was another general consideration. For control, versatility was again to the fore. Adlib specified a Soundcraft Vi1 console which is ideal for small to medium conferences and events and can easily cater for a full band without needing a supplementary console. Nelson recommended the Vi stagebox with the Neutrik OpticalCON fibre connection that R&B already utilise for their projection systems and designed a cable infrastructure that made the system both flexible and modular for a range of events. Adlib additionally designed a practical custom amp rack system for R&B consisting of single and doubled up LA8 units, which allow them to easily split the system down into smaller components or use it as one large system as required. With some real foresight, at R&B’s request, all their rack distribution panelling is built to be compatible with Adlib’s own systems and also with those of Nitelites, to enable seamless cross and supplementary rentals between the three companies. R&B’s key crew received comprehensive manufacturer led training on both L-Acoustics elements and the Soundcraft console at Adlib’s bespoke training facility. The finished system was actually delivered directly from Adlib, complete with custom Adlib manufactured flightcases, to its first R&B gig in Sheffield as a ready-to-use system. From there it went straight up to Newcastle, and was followed by a further four days of intensive onsite training. The speaker and cable flightcases are all standardised at a quarter truck width for speed, efficiency and maximum portability. In picture: Mick Storrie (R&B), Ian Nelson (Adlib), Antony Crerar (R&B), Andy Main, Lucy McClelland and Chris Ryan, all R&B.